Using one of the most utilitarian of sleights, the Comeback Card will have the audience coming back for more. The magician shows the top card on a normal deck of playing cards. He puts the card back and then deals it from the deck into his hand. He puts the card in the middle of the pack and slowly pushes it in. With a magical pass of the hand he then deals off the top card of the deck, showing that it is the same card - the card moved magically from the middle of the deck back to the top! When showing the top card; the magician is actually showing the second from the top card. No advance preparation is required for the basic Comeback Card, but there is a variant explained below that requires a bit of set up. This really is a quick effect and often should be used as part of an overall card routine. It should not be shown repeatedly or the secret will be figured out. The magician should be familiar with the sleight of hand move called the double lift. It requires the magician to show two cards as if it were one card. 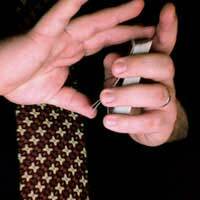 Riffling through the deck with the right thumb, the magician catches a break at the second card from the top. Lifting the packet of two cards as if it were one, the magician shows the face of the second card, names it and calls it the top card. Turning the packet back over on top of the deck, the magician then deals off the top, indifferent card into his right hand, face down. A nice variant of this trick, part of a card routine called “The Ambitious Card”, does require a bit of set up. This time, after dealing off the top card (the nine of clubs) and placing it in the middle of the deck, the magician should stop when the card is halfway pushed in. Holding the deck in his left hand, the magician can extend his forefinger and turn the deck face up, towards the audience. The tip of his finger covers the Nine symbol, and the audience will see an arrangement of clubs pips on the card that looks like the eight. The rest of the trick is performed the same way. The double lift is a very valuable tool that must be practiced diligently. If it is done incorrectly it will ruin the trick and many others.